Today we have that letter, which provides an excellent overview of the H7N9 situation, along with the CHP's case criteria for reporting of suspected cases. Due to its length I've only excerpted parts of it. Follow the link to read it in its entirety. We would like to draw your attention to the high activity of avian influenza viruses in neighboring areas and overseas countries and solicit your support to remain vigilant against avian influenza. The activity of avian influenza A(H7N9) viruses has been increasing markedly in Mainland China since the end of 2016. This wave (i.e. the fifth wave) has been progressing much faster than that in the previous winter. According to the National Health and Family Planning Commission, the number of reported cases of human infection with avian influenza A(H7N9) virus in Mainland China increased from six in November 2016 to 106 and 192 cases in December 2016 and January 2017 respectively, as compared to 40 cases recorded from November 2015 to January 2016. In this wave so far, 357 human H7N9 cases have been reported by health authorities in 17 provinces/municipalities/autonomous regions in the Mainland (as of February 14, 2017) (Annex I). The number of cases recorded has already exceeded that recorded in the previous four waves (135, 318, 224 and 121 in the first, second, third and fourth wave respectively). Among the 357 cases, their ages ranged from 3 – 91 years (median: 57). Most cases presented with severe conditions. Among the cases where information on exposure history was known, as previous waves, most reported prior exposure to live poultry or potentially contaminated environments, including in live poultry markets (LPMs). According to the World Health Organization, there has been no indication of significant changes in the epidemiology of the human infections, no evidence of sustained human-to-human transmission and no significant changes in the clinicalpresentation or disease outcome. Apart from H7N9, outbreaks of highly pathogenic avian influenza A(H5N2), A(H5N6) and A(H5N8) have occurred in farms in many parts of the world including Mainland China, Taiwan, Japan, Korea and many countries in Europe. Two cases of human infection with H5N6 have been detected in Mainland China in late 2016. In this regard, we would like to urge you to pay special attention to patients who presented with fever or influenza-like illness (ILI). Travel history and relevant exposure history during travel should be obtained from them. Please note that the history of possible exposure to poultry or contaminated environments may not be voluntarily told by the patients in the beginning. If patients report seeing any live poultry during their travel in the Mainland, detailed information on possible exposure to environments contaminated by poultry should be solicited from them. Any patients with acute respiratory illness or pneumonia, and with at-risk exposure (including live poultry workers, history of visiting market with live poultry, contact with poultry, etc.) in affected areas within the incubation period (i.e. 10 days before onset of symptoms) should be managed as suspected cases and immediately reported to the Central Notification Office of the Centre for Health Protection (CHP) via fax (24772770), phone (24772772) or CENO On-line (https://cdis.chp.gov.hk/CDIS_CENO_ONLINE/ceno.html). Please refer to the Annex II for the reporting criteria. Private doctors should contact the Medical Control Officer of the Department of Health at pager: 7116 3300 (call 9179) when reporting any suspected case outside office hours. The CHP will make arrangement to send the patient to a public hospital for isolation, testing and treatment. Besides, it is important to isolate the patient to minimise contact with or exposure to staff and other patients and advise the patient to wear a surgical mask while waiting for transfer. The CHP has collaborated with the Hospital Authority to enhance surveillance for avian influenza. The following cases will be routinely tested for avian influenza: (i) community-acquired pneumonia (CAP) of unknown causes, requiring admission to intensive care unit, occurring in clusters or involving healthcare workers, irrespective of travel history; (ii) paediatric in-patients with ILI and travel history to an affected area; and (iii) CAP with travel history to an affected area. 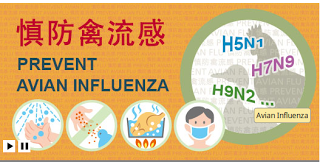 For updates on the latest situation of avian influenza, please refer to the designated website of the CHP (English: http://www.chp.gov.hk/en/view_content/24244.html; Chinese: http://www.chp.gov.hk/tc/view_content/24244.html). Please draw the attention of the healthcare professionals and supporting staff in your institution/ working with you to the above. Thank you for your ongoing support in combating communicable diseases.